Vancouver International airport (YVR) is your gateway to last year's home of the Winter olympics - Vancouver and British Columbia, Canada. Due to the airport's proximity with Asia, YVR is a major gateway for your Asia bound flights. Vancouver International Airport is located on Sea Island in British Columbia, Canada. 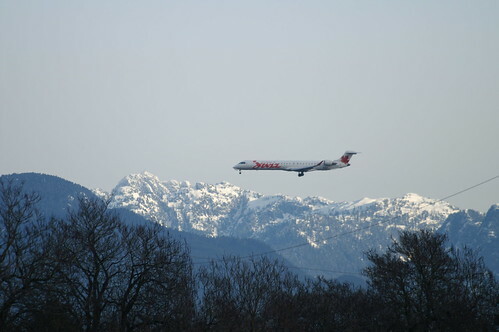 The airport is situated about 12km from downtown Vancouver. The second busiest airport in Canada served over 17 million passengers in 2011 and in 2010 won the Skytrax award for best North American airport. Vancouver International has been pet named the best airport in North America. Vancouver Airport in relation to Vancouver. If you're flying in to Vancouver, the airport will set you up for a comfortable boarding, and if you're flight gets delayed, which we hope it wouldn't, you'll be all set for a wait. On the other side of the coin, if you're arriving into the beautiful British Columbia, Vancouver International Airport will warmly welcome you and make the final leg of your journey smooth. Sustainability: YVR is commited to doing it's part in being a sustainable business. Many wouldn't know that YVR is part of a green building. This means the construction and maintenance of the buildings are done in a sustainable and efficient manner. One example of this is the Solar powered hot water heating systems. More than 800 gallons of water is heated up by solar energy every hour, resulting in a $110,000 energy saving each year. This is only one of many initiatives YVR has to be sustainable. Dining: Feel right at home with the delicious choices of dining options. The international terminal offers choices like Japanese, to Euro style cafes, Fast food Burger King to StarBux. You'll never go amiss for something to eat. The domestic terminal also offers, Bars and grills, cafe's and fast foods. Car Rental: For when you land in Vancouver Airport, the car rental desks are located just steps from the terminal on the ground floor of the parking area. So you don't need to wait in any undesirable queues when you get off your plane. Book ahead for a rental car online through Vancouver Airport Car Rental or find some rental deals at this blog. Hotels: Stay the night near the airport and travel fresh after you've had a few winks. Fairmont Vancouver Airport is a luxury hotel on site with sound proofed room and a spa. No shuttle is required as the lobby extends directly onto the airport's concourse. This hotel was voted in 2011 by Skytrax as the Best North American Hotel. Check out Vancouver International airport for more information or to check your flights times. and a landing at Vancouver Airport.